Ancient Chinese coinage includes some of the earliest known coins. These coins, used as early as the Spring and Autumn period (770–476 BC), took the form of imitations of the cowrie shells that were used in ceremonial exchanges. 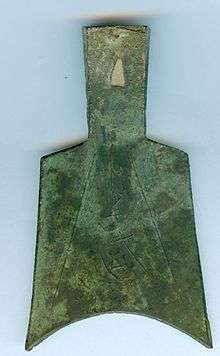 The Spring and Autumn period also saw the introduction of the first metal coins; however, they were not initially round, instead being either knife shaped or spade shaped. Round metal coins with a round, and then later square hole in the center were first introduced around 350 BC. The beginning of the Qin Dynasty (221–206 BC), the first dynasty to unify China, saw the introduction of a standardised coinage for the whole Empire. Subsequent dynasties produced variations on these round coins throughout the imperial period. At first, distribution of the coinage was limited to use around the capital city district but by the beginning of the Han Dynasty, coins were widely used for such as when paying tax, salaries and fines. Ancient Chinese coins are markedly different from coins produced in the west. Chinese coins were manufactured by being cast in molds, whereas western coins were typically cut and hammered or, in later times, milled. Chinese coins were usually made from mixtures of metals such copper, tin and lead, from bronze, brass or iron: precious metals like gold and silver were uncommonly used. The ratios and purity of the coin metals varied considerably. Most Chinese coins were produced with a square hole in the middle. This was used to allow collections of coins to be threaded on a square rod so that the rough edges could be filed smooth, and then threaded on strings for ease of handling. Official coin production was not always centralised, but could be spread over many mint locations throughout the country. Aside from officially produced coins, private coining was common during many stages of history. Various steps were taken over time to try to combat the private coining and limit its effects and making it illegal. At other times private coining was tolerated. The coins varied in value throughout the history. Some coins were produced in very large numbers – during the Western Han, an average of 220 million coins a year were produced. Other coins were of limited circulation and are today extremely rare – only six examples of Da Quan Wu Qian from the Eastern Wu Dynasty (222–280) are known to exist. Occasionally, large hoards of coins have been uncovered. For example, a hoard was discovered in Jiangsu containing 4,000 Tai Qing Feng Le coins and at Zhangpu in Shaanxi, a sealed jar containing 1,000 Ban Liang coins of various weights and sizes, was discovered. "With the opening of exchange between farmers, artisans, and merchants, there came into use money of tortoise shells, cowrie shells, gold, coins (Chinese: 錢; pinyin: qián), knives (Chinese: 刀; pinyin: dāo), spades (Chinese: 布; pinyin: bù) This has been so from remote antiquity." Inscriptions and archaeological evidence shows that cowrie shells were regarded as important objects of value in the Shang Dynasty (c. 1766–1154 BC). In the Zhou period, they are frequently referred to as gifts or rewards from kings and nobles to their subjects. Later imitations in bone, stone or bronze were probably used as money in some instances. Some think the first Chinese metallic coins were bronze imitations of cowrie shells found in a tomb near Anyang dating from around 900 BC, but these items lack inscriptions. Gold coins marked with "Ying yuan". "Ying" being the name of the Chu capital. It has been suggested that pieces of jade were a form of money in the Shang Dynasty. Metal money brands (Chinese: 錢牌; pinyin: qián pái) were rarely used in the state of Chu. They were used again in the Song dynasty. Hollow handled spades (Chinese: 布幣; pinyin: bùbì) are a link between weeding tools used for barter and stylised objects used as money. They are clearly too flimsy for use, but retain the hollow socket by which a genuine tool could be attached to a handle. This socket is rectangular in cross-section, and still retains the clay from the casting process. In the socket the hole by which the tool was fixed to its handle is also reproduced. Ming knives: Ming knives are generally smaller than pointed tip knives, and their tips are approximately straight. This type of knife money takes its name from the character on the obverse, which has traditionally been read as ming (Chinese: 明; pinyin: míng). Other proposals have been yi (Chinese: 易; pinyin: yì), ju (Chinese: 莒; pinyin: jǔ), ming (Chinese: 盟; pinyin: méng), and zhao (Chinese: 召; pinyin: zhào). A mint for Ming knives was unearthed at Xiadu, to the south west of Peking. This was the site of Yi, capital of the State of Yan from 360 BC, so the reading of yi has found favour recently. Moulds have also been discovered in Shandong. These coins themselves have been found, often in great quantities, in the provinces of Hebei, Henan, Shandong, Shanxi, Shaanxi, Manchuria, and even as far afield as Korea and Japan. They are found together with pointed and square foot spade money. Two different shapes of Ming knife are found. The first, presumably the earlier, is curved like the pointed tip knives. The second has a straight blade and often a pronounced angled bend in the middle. This shape is known as 磬 qing, a chime stone. Their alloy contains around 40% copper; they weigh around 16 grams. Obverse and reverse of a Ban Liang coin from the Western Han Dynasty. The Ban Liang coins take their name from their two character inscription Ban Liang (Chinese: 半兩; pinyin: bàn liǎng), which means half a liang. The liang, the Chinese ounce, consisted of 24 zhu (Chinese: 銖; pinyin: zhū), and was the equivalent of about 16 grams. Thus the original Ban Liang weighed the equivalent of 12 zhu – 8 grams; however, it kept this inscription even when its weight was later reduced. This means that Ban Liangs are found in a great variety of sizes and calligraphic styles, all with the same inscription, which are difficult to classify and to date exactly, especially those of unofficial or local manufacture. These coins were traditionally associated with Qin Shi Huang Di, the first Chinese Emperor, who united China in 221 BC. The History of Han says: "When Qin united the world, it made two sorts of currency: that of yellow gold, which was called yi and was the currency of the higher class; and that of bronze, which was similar in quality to the coins of Zhou, but bore an inscription saying Half Ounce, and was equal in weight to its inscription." Obverse and reverse of a Shang Lin San Guan Wu Zhu coin. "The granaries in the cities and the countryside were full and the government treasuries were running over with wealth. In the capital the strings of cash had been stacked up by the hundreds of millions until the cords that bound them had rotted away and they could no longer be counted." The San Zhu (Chinese: 三銖; pinyin: sān zhū; literally: "Three Zhu – 1.95 grams") coin was issued either between 140-136 BC, or between 119–118 BC. The records are ambiguous, but the later date is generally preferred. The Wu Zhu (Chinese: 五銖; pinyin: wǔ zhū; literally: "Five Zhu – 3.25 grams") was first issued in 118 BC, this inscription was used on coins of many regimes over the next 700 years. Sometimes Wu Zhus can be dated specifically from dated moulds that have been discovered, or from their find spots, but the majority cannot. Those of the Western Han Dynasty have a square top to the right hand component of zhu; on later coins, this is rounded. Only a few of the varieties that have been described by numismatists are included here. Jun Guo Wu Zhu (Chinese: 郡國五銖; pinyin: jùn guó wǔ zhū) (118–115 BC) is a large and heavy coin, with the edges not filed. Sometimes has a rimless reverse. Taken to be the earliest Wu Zhu. According to the History of Han, in 118 BC the Commanderies (Jun) and Principalities (Guo) were ordered to cast 5 zhu coins with a circular rim so that it would be impossible to clip them to glean a bit of copper. Chi Ze Wu Zhu (Chinese: 赤仄五銖; pinyin: chì zè wǔ zhū) (115–113 BC) is a lighter coin than the above, with filed edges. The Han records state that in 115 BC the mints in the capital were requested to cast Chi Ze coins, with one being worth five local coins. Only these were to circulate. Chi Ze means Red (or Shining) Edge, referring to the red copper showing when the edges were filed smooth. Some examples of this coin were found from the tomb of Liu Sheng, Prince of Zhongshan, who died in 113 BC. Shang Lin San Guan Wu Zhu (Chinese: 上林三官五銖; pinyin: shàng lín sān guān wǔ zhū) (From 113 BC) refers to the Three Offices of Shang Lin Park which were the Office for Coinage, the Office for Sorting Copper, and the Office of Price Equalisation. Minting was now confined to the central authorities. These coins usually have a raised rim on the top of the hole on the obverse. Their quality was so high that forgery became unprofitable except to true artisans, great villains, or thieves. All earlier coins were to be melted down and the copper taken to Shang Lin. Wu Zhu Coins (AD 25). Even after the end of the Wang Mang regime (see below), the coinage system remained in disarray. Cloth, silk and grain were used as money along with coins. However, cash was the normal measure of wealth and was used in large quantities. When Yang Ping (92–195) was in economic difficulties, he was offered a gift of one million cash. Wu Zhu coins continued to be issued, along with other coins, until the end of the sixth century. Some coins can be attributed to specific reigns or events; many can not. The Iron Wu Zhu, resembling the W. Han coin, is attributed to Gongsun Shu, who rebelled in Sichuan in AD 25, and issued iron coins, two being equal to one Jian Wu Wu Zhu(Chinese: 建武五銖; pinyin: jiàn wǔ wǔ zhū). Head of the zhu component rounded. Typical of Eastern Han Wu Zhus. In AD 30, a ditty was sung by the youths of Sichuan: "The yellow bull! the white belly! Let Wu Zhu coins return". This ridiculed the tokens of Wang Mang and the iron coins of Gongsun Shu, which were withdrawn by the Eastern Han Emperor Guang Wu in the 16th year of Jian Wu (AD 40). The Emperor was advised that the foundation of the wealth of a country depends on a good political economy, which was found in the good old Wu Zhu coinage, and so reissued the Wu Zhu coins. The Si Chu Wu Zhu (Chinese: 四出五銖; pinyin: sì chū wǔ zhū; literally: "Four Corner five zhu") has four lines on reverse radiating from the corners of the hole. It is attributed to the Eastern Han Emperor Ling, AD 186. The four lines are said to represent wealth flowing from a ruined city—an omen of the overthrow of the Han Dynasty. Shu Wu Zhu (Chinese: 蜀五銖; pinyin: shǔ wǔ zhū) coins have the word Chuan (Chinese: 川; pinyin: chuān) on the obverse, or the numbers 1–32 on the reverse, in incuse characters. They are attributed to the Kingdom of Shu (221-265) by virtue of their find spots in Gansu. Lord Shen's green cash line town streets." Apparently this means that Lord Shen's cash were small and light. Dang Liang Wu Zhu (Chinese: 當兩; pinyin: dāng liǎng; literally: "Worth Two") is a large thick coin, with a nominal weight of 8 zhu. They are attributed to Emperor Wen of the Southern Dynasties Song Dynasty, who had them cast in 447 as a measure against coining malpractices. Tian Jian Wu Zhu has an inner rim on obverse. At the start of the Liang Dynasty, money was only used around the capital. Elsewhere grain and cloth were used for trade. In the south, everyone used gold and silver. Therefore, in the 1st year of the Tian Jian period (502), the Emperor Wu cast Wu Zhu coins with an outer and inner rim. He also cast another sort without a rim called the female coin. The two sorts circulated together. Nu Qian (Chinese: 女錢; pinyin: nǚ qián; literally: "The Female Coin") have no outer rim. An iron Wu Zhu with four lines radiating from the corners of the hole on the reverse. Attributed to Emperor Wu of Liang in 523. By 535, the traders in Sichuan were complaining of the trouble of stringing together such a number of [cheap] coins, and of the large number of carts needed to transport them. Liang Zhu Wu Zhu (Chinese: 兩柱五銖; pinyin: liǎng zhù wǔ zhū; literally: "Two Pillar") has a dot above and below the hole on the obverse. They are attributed to Emperor Yuan of the Liang Dynasty in 552. They were intended to be the equivalent of ten ordinary coins. Si Zhu Wu Zhu (Chinese: 四柱五銖; pinyin: sìzhù wǔ zhū; literally: "Four Pillar") have two dots on the obverse and reverse. They are attributed to Emperor Jing of the Liang Dynasty in 557. They were originally intended to be the equivalent of twenty ordinary coins, they soon became worth one. However, similar coins with dots have been found in tombs of a much earlier date. Chen Wu Zhu. (Chinese: 陳五銖; pinyin: chén wǔ zhū) has a stout outer rim and no inner rim. The top part of the zhu component is square while the bottom part round. They are attributed to Emperor Wen of the Southern Dynasties Chen Dynasty and cast from Tian Jia 3 (562). One Chen Wu Zhu was worth ten small goose-eye coins. Yong Ping Wu Zhu (Chinese: 永平五銖; pinyin: yǒng píng wǔ zhū) have characters long and thin. They are attributed to Emperor Xuan of the Northern Wei Dynasty, during the Yong Ping period (510). Da Tong Wu Zhu (Chinese: 大統五銖; pinyin: dà tǒng wǔ zhū) have a stout outer rim, inner rim only by the wu. Crossing lines of wu straight. Attributed to Emperor Wen of the Western Wei Dynasty, Datong period (540). Western Wei Wu Zhu (Chinese: 西魏五銖; pinyin: xīwèi wǔ zhū) have crossing lines of wu straight. The inner rim is by the wu only. They were previously attributed to the Sui Dynasty, however coins of this distinctive type were found within the tomb of HouYi of the Western Wei (535-56). Sui Wu Zhu (Chinese: 随五銖; pinyin: suí wǔ zhū) is hour glass wu, inner rim by the wu only. They were first cast by Emperor Wen in 581. After introducing these new coins, the Emperor ordered all the frontiers to hand over 100 cash as samples in 583, and the next year strictly forbade the circulation of old coins and commanded that when this was disobeyed, the responsible officials should be fined half a years salary. 1,000 coins weighed 4 jin 2 liang. Minting privileges were granted to several imperial princes during this reign. Bai Qian Wu Zhu (Chinese: 白錢五銖; pinyin: bái qián wǔ zhū; literally: "White Coin") has writing as above. The whitish colour of this coin is due to the addition of lead and tin to the alloy, which was done officially from 585. Yan Huan Wu Zhu (Chinese: 綖環五銖; pinyin: yán huán wǔ zhū; literally: "Fringe or Thread Ring") is a Wu Zhu whose middle has been cut out to make two coins. Zao Bian Wu Zhu (Chinese: 鑿邊五銖; pinyin: záo biān wǔ zhū; literally: "Chiselled Rim") is the inner portion of a Wu Zhu whose outer portion has gone to make a thread ring. Surviving moulds show that some Wu Zhus were actually cast like this. E Yan (Chinese: 鵝眼; pinyin: É yǎn; literally: "Goose Eye") or Ji Mu (Chinese: 雞目; pinyin: jī mù; literally: "Chicken Eye") are the names given to various diminutive Wu Zhu coins. 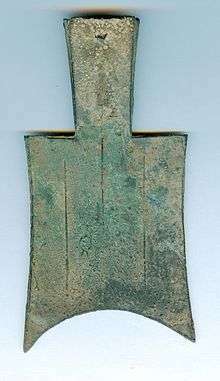 This is a common type with sharp legends which has been found in Western Han tombs of 73-33 BC. Obverse and reverse of a Da Quan Wu Shi coin. Yi Dao Ping Wu Qian (Chinese: 一刀平五千; pinyin: yīdāo píng wǔqiān; literally: "One Knife Worth Five Thousand") on which the Yi Dao characters are inlaid in gold. Between AD 9 and 10 he introduced an impossibly complex system involving tortoise shell, cowries, gold, silver, six round copper coins, and a reintroduction of the spade money in ten denominations. The Six Coins. AD 9-14. Da Quan Wu Shi (Chinese: 大泉五十; pinyin: dàquán wǔshí) is a round coin with a nominal value of fifty Wu Zhu. The Ten Spades. AD 10-14. "Those who dare to oppose the court system and those who dare to use Wu Zhus surreptitiously to deceive the people and equally the spirits will all be exiled to the Four Frontiers and be at the mercy of devils and demons." The result of this was that trade and agriculture languished, and food became scarce. People went about crying in the markets and the highways, the numbers of sufferers being untold. In AD 14, all these tokens were abolished, and replaced by another type of spade coin and new round coins. According to Schjöth, Wang Mang wished to displace the Wu Zhu currency of the Western Han, owing, it is said, to his prejudice to the jin (Chinese: 金; pinyin: jīn; literally: "gold") radical in the character zhu (Chinese: 銖; pinyin: zhū) of this inscription, which was a component part of the character Liu, the family name of the rulers of the House of Han, whose descendant Wang Mang had just dethroned. And so he introduced the Huo Quan currency. One of the reasons, again, that this coin circulated for several years into the succeeding dynasty was, so the chroniclers say, the fact that the character quan (Chinese: 泉; pinyin: quán) in the inscription consisted of the two component parts bai (Chinese: 白; pinyin: bái; literally: "white") and shui (Chinese: 水; pinyin: shuǐ; literally: "water"), which happened to be the name of the village, Bai Shui in Henan, in which the Emperor Guang Wu, who founded the Eastern Han, was born. This circumstance lent a charm to this coin and prolonged its time of circulation. The Huo Quan did indeed continue to be minted after the death of Wang Mang – a mould dated AD 40 is known. Obverse and reverse of a Zhi Bai Wu Zhu coin. This state only issued Wu Zhu coins. Zhi Bai Wu Zhu (Chinese: 直百五銖; pinyin: zhí bǎi wǔ zhū; literally: "Value One Hundred Wu Zhu") Often found with incuse characters on the reverse. Zhi Bai (Chinese: 直百; pinyin: zhí bǎi; literally: "Value One Hundred") When Liu Bei, later ruler of Shu and one of the heroes of Romance of the Three Kingdoms, took Chengdu in Sichuan in 214, he was advised to issue "value one hundred" coins to overcome the problems of maintaining his troops; hence these coins are attributed to him. Rev: Stars and waves pattern. The Tai Ping Bai Qian coin was at first attributed to Sun Liang of Eastern Wu, who adopted a Tai Ping year title in 256. Most of them, however, have been unearthed in Sichuan (in one instance in a tomb dated to 227) together with Zhi Bai coins, which, together with the incuse marks on the reverse, indicates that they are issues of Shu Han. The fancy calligraphy and reverses of the large coins are more typical of amulets than circulating coins, and Peng seeks to associate them with the Taiping Taoists of the time. In the 1860s, a jar of small "goose eye" coins was dug up in Chengdu in Sichuan. It contained Tai Ping Bai Qian, Ding Ping Yi Bai, Zhi Bai, and Zhi Yi coins. This reinforces the supposition that all these coins are near contemporaries, issued by Shu Han. Da Quan Wu Qian (Chinese: 大泉五千; pinyin: dàquán wǔqiān; literally: "Large Coin, Five Thousand"): Only six specimens are known. Sima Yan founded the Jin Dynasty in AD 265, and after the defeat of Eastern Wu in 280, China was reunified for a while. At first, the dynasty was known as the Western Jin with Luo-yang as its capital; from 317, it ruled as the Eastern Jin from Nanking. The historical records do not mention the specific casting of coins during the Jin Dynasty. In the south, reductions in the weights of coins caused great price fluctuations, and cloth and grain were used as substitutes for coins. In the north, numerous independent kingdoms (The Sixteen Kingdoms) issued some interesting coins. Liang Zao Xin Quan (Chinese: 涼造新泉; pinyin: liáng zào xīnquán; literally: "Liang Made New Coin") is attributed to King Zhang Gui (317-376), who ruled in the north-western area. Feng Huo (Chinese: 豐貨; pinyin: fēng huò; literally: "The Coin of Abundance") has text that uses Seal Script. There is no rim. They were cast by Emperor Shi Le in 319 at Xiangguo (now Xingtai in Hebei) with a weight of 4 zhu. They are known as the Cash of Riches – keeping the coin about one was said to bring great wealth. However, the historical record states that the people were displeased, and that in the end the coin did not circulate. Han Xing (Chinese: 漢興; pinyin: hàn xìng) as an inscription either right and left or above and below. In 337, Li Shou of Sichuan adopted the period title of Han Xing. This is the first recorded use of a period title on a coin. The period ended in 343. Obverse and reverse of a Yong An Wu Zhu coin. Si Zhu (Chinese: 四銖; pinyin: sì zhū; literally: "Four Zhu") No inner rims on obverse. Issued by Emperor Wen in 430, from the capital at Nanking. A Coinage Office was established under the Chamberlain for Palace Revenues. Xiao Jian (Chinese: 孝建; pinyin: xiào jiàn; literally: "Xiaojian period") with the reverse: Si Zhu (Chinese: 四銖; pinyin: sì zhū; literally: "Four Zhu") A poor coin, with many variations. Issued by Emperor Xiao from 454. Actual weight nearer 2 zhu. Withdrawn by the Emperor Ming in 467. The last three small coins, weighing only 2 zhu, were all issued by Emperor Fei in 465. As the Jinghe and Yongguang periods only lasted for a few months, these coins are very rare. The Song capital was at Nanking. Tai Qing Feng Le (Chinese: 太清豐樂; pinyin: tài qīng fēng lè; literally: "Tai Qing, Prosperous and Happy") are attributed to the Tai Qing period (547–549) of Emperor Wu. A hoard was discovered in Jiangsu containing 4,000 Tai Qing Feng Le coins with various other sorts of coins showing that this is not an amulet as had been claimed by some authorities. Tai Huo Liu Zhu (Chinese: 太貨六銖; pinyin: tài huò liù zhū; literally: "The Large Coin Six Zhu") were issued by Emperor Xuan in 579. At first the coin was equivalent to ten Wu Zhus. Later the value was changed to one, and the contemporary saying "They cried before the Emperor, their arms akimbo" is said to refer to the discontent among the people caused by this. The seal character for liu suggests the "arms akimbo" posture. The coin was withdrawn in 582 when the Emperor died, and Wu Zhus were adopted. The Chen capital was Nanking. Tai He Wu Zhu (Chinese: 太和五銖; pinyin: tài hé wǔ zhū; literally: "Taihe [period] Wu Zhu"): Although the Northern Wei had been established in 386, its Turkish and Mongolian tribes had retained a nomadic way of life with no need for money until 495, when Emperor Xiao Wen issued this coin, probably at the capital Datong in Shanxi. Yong An Wu Zhu (Chinese: 永安五銖; pinyin: yǒng'ān wǔ zhū; literally: "Yong An [period] Wu Zhu") coins were first issued in the autumn of the second year of Yongan (529) by Emperor Xiao Zhuang. It is said that they continued to be cast until 543 under the Eastern and Western Wei dynasties. During the Eastern Wei dynasty, private coins with nicknames such as Yongzhou Green-red, Liangzhou Thick, Constrained Cash, Auspicious Cash, Heyang Rough, Heavenly Pillar, and Red Halter circulated, all possibly Yong An Wu Zhus. Chang Ping Wu Zhu (Chinese: 常平五銖; pinyin: chángpíng wǔ zhū; literally: "The Constant and Regular Wu Zhu") were cast by Emperor Wen Xuan in 553. They are finely made. The Northern Qi capital was Linzhang in Hebei. Under the Northern Qi, there was an Eastern and a Western Coinage Region, under the Chamberlain for Palace Revenues. Each Regional Director supervised 3 or 4 Local Services. Bu Quan (Chinese: 布泉; pinyin: bù quán; literally: "Spade Coin") were issued in 561 by Emperor Wu of the Northern Zhou dynasty. One was to be worth five Wu Zhus. To distinguish this coin from the Bu Quan of Wang Mang—the stroke in the middle of quan is continuous. They were withdrawn in 576. Wu Xing Da Bu (Chinese: 五行大布; pinyin: wǔháng dà bù; literally: "The Large Coin of the Five Elements [metal, wood, water, fire, and earth]") were issued in 574 by Emperor Wu. They were intended to be worth ten Bu Quans. Illegal coining soon produced specimens of a reduced weight and the authorities banned the use of this coin in 576. This inscription is frequently found on amulets. Yong Tong Wan Guo (Chinese: 永通萬國; pinyin: yǒng tōng wànguó; literally: "Everlasting Circulation in Ten Thousand Kingdoms") were issued in 579 by Emperor Xuan. There nominal weight was 12 zhu, and the coin was meant to be equivalent to ten Wu Xing coins. The above coins, the "Northern Zhou Three Coins" are written in the Yu Zhu (Jade Chopstick) style of calligraphy which is greatly admired. 3 and 4 Zhu coins are a small group of square and round coins which do not always have a hole in the middle. They are usually attributed to the time of the Southern and Northern Dynasties. This was an unsettled period which produced some very poor coinage. The obverse inscriptions give a weight of 3 or 4 zhu. The reverse inscriptions appear to be place names. Obverse and reverse of a Kai Yuan Tong Bao coin. Kai Yuan Tong Bao (Chinese: 開元通寶; pinyin: kāiyuán tōng bǎo; literally: "The Inaugural Currency") were the main coin issued by the Tang. It was cast for most of the dynasty, a period of nearly 300 years. It was first issued by the Emperor Gao Zu in the autumn of the 4th year of the Wu De period (August 621). Its diameter was to be 8 fen. The weight was set at 2.4 zhu, ten to the liang. 1,000 coins weighed 6 jin 4 liang. The legend was written by the famous calligrapher Ouyang Xun in a much admired mixture of the Bafen and Li (official or clerkly) styles of writing. This is the first to include the phrase tong bao, used on many subsequent coins. The inscription was used by other regimes in later periods; such coins can be distinguished from Tang coins by their workmanship. Minting and copper extraction were centrally controlled, and private casting was punishable by death. For the first time we find regulations giving the prescribed coinage alloy: 83% copper, 15% lead, and 2% tin. Previously the percentages used seem to have been on an ad hoc basis. Actual analyses show rather less copper than this. A crescent-shaped mark is often found on the reverse of Kai Yuans. The legend is that the Empress Wende inadvertently stuck one of her fingernails in a wax model of the coin when it was first presented to her, and the resulting mark was reverentially retained. Other imperial ladies have also been proposed as the source of these nail marks, especially the Imperial Consort Yang. Peng explores the possibility of a foreign source for them. More prosaically, they appear to be a control system operated by the mint workers. At first, mints were set up in Luoyang in Henan, and also in Peking, Chengdu, Bingzhou (Taiyuan in Shanxi), and then Guilin in Guangxi. Minting rights were also granted to some princes and officials. By 660, deterioration of the coinage due to forgery had become a problem. The regulations were reaffirmed in 718, and forgeries suppressed. In 737, the first commissioner with overall responsibility for casting was appointed. In 739, ten mints were recorded, with a total of 89 furnaces casting some 327,000 strings of cash a year. 123 liang of metal were needed to produce a string of coins weighing 100 liang. In the late 740s, skilled artisans were employed for casting, rather than conscripted peasants. Despite these measures, the coinage continued to deteriorate. In 808, a ban on hoarding coins was proclaimed. This was repeated in 817. Regardless of the rank of a person, they could not hold more than 5,000 strings of cash. Cash balances exceeding this amount had to be expended within two months to purchase goods. This was an attempt to compensate for the lack of cash in circulation. By 834, mint output had fallen to 100,000 strings a year, mainly due to the shortage of copper. Forgeries using lead and tin alloys were produced. In 845, in the Huichang period, the Emperor Wu Zong, a fervent follower of Taoism, destroyed the Buddhist monasteries and used the copper bells, gongs, incense burners and statues to cast coins in various localities. These local mints were under the control of the provincial governors. The New Tang History states that Li Shen, governor of Huainan province, requested that the empire might cast coins bearing the name of the prefecture in which they were cast, and this was agreed. These coins with mint names on the reverses, known as Huichang Kai Yuans, are of poor workmanship and size compared with the early Kai Yuans. However, when Emperor Xuanzong ascended to the throne the next year, this policy was reversed, and the new coins were recast to make Buddhist statues. Archaeological discoveries have assisted numismatists in dating various varieties of the Kai Yuan more closely. Qian Feng Quan Bao (Chinese: 乾封泉寶; pinyin: qián fēng quán bǎo) were cast by the Emperor Gao Zong (649–83) in 666. In an attempt to overcome a shortage of copper, one of the Qian Feng coins was to be equivalent to ten old coins, although its weight of 2.4 zhu was the same as a one cash coin. This led to extensive forgery, and the coin was withdrawn after a year. Judging by their find spots, these coin were cast by the local government in the Kuche area of Xinjiang in around 760–780. Da (Chinese: 大; pinyin: dà) is a degenerate form of the above but only has the da included. Yuan (Chinese: 元; pinyin: yuán) is similar to the above coin however it has only the character yuan included. Jian Zhong tong bao (Chinese: 建中通寶; pinyin: jiàn zhōng tōng bǎo) The Jian Zhong Period was 780–83. In 755, a revolt started in the north-west of China. The capital, Luoyang, was taken, and the Emperor fled to Sichuan. One of the rebels, Shi Siming, issued coins at Luoyang from 758. Shi was killed in 761, and the revolt was eventually suppressed in 763 with the help of foreign troops. De Yi yuan bao (Chinese: 得壹元寶; pinyin: de yī yuánbǎo; literally: "Obtain Unity") has the inscription De Yi, which also implies "last for one year". They were felt to be inauspicious, and were changed to Shun Tian (the period title) in 759. Obverse and reverse of a Guang Tian Yuan Bao coin from the Former Shu Kingdom. "From now on, except for court objects, weapons, official objects and mirrors, and cymbals, bells and chimes in temples and monasteries, all other bronze utensils are banned... Those who hoard more than 5 jin, no matter how much the amount, will be executed. Those who abetted them will be exiled for two years, followed by labour service for one year. Those around them will suffer 100 strokes of the cane. Informers will be rewarded with 30 strings of cash." The south enjoyed somewhat better political and economic conditions, and saw an advance in trade. A great variety of coinage, including large and base metal coins, was issued in this area. Kai Ping tong bao (Chinese: 開平通寶; pinyin: kāipíng tōng bǎo) and also a Kai Ping yuan bao coins could have been issued by Zhu Wen when he overthrew the Tang in 907. However, only a few specimens of each coin are known, and one of each is shown in China National Museum and China History Museum. Some authorities doubt their authenticity. Tian Cheng yuan bao (Chinese: 天成元寶; pinyin: tiānchéng yuánbǎo) were issued by Emperor Ming in the Tiancheng period (926-29). Tian Fu yuan bao (Chinese: 天福元寶; pinyin: tiānfú yuánbǎo) were issued by Emperor Gao Zong in the Tianfu period from 938. From 939, private casting was permitted for a few months, resulting in coins of adulterated alloy. Han Yuan tong bao (Chinese: 漢元通寶; pinyin: hàn yuán tōng bǎo) coin's pattern is based on the Kai Yuan. In 948, during the reign of Emperor Gao Zu, the President of the Department of Imperial Feasts requested permission to set up a mint in the capital (Kaifeng, Henan). There is no specific record of casting Han Yuans. 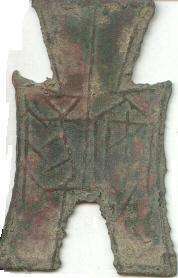 Issued by Wang Jian (907-18). Issued by Wang Zongyan, son of Wang Jian (919–25). Kai Yuan tong bao (Chinese: 開元通寶; pinyin: kāiyuán tōng bǎo) have a large dot above on the reverse side. They are made of iron and date from 922. The same coin cast in bronze is extremely rare. Kai Yuan tong bao (Chinese: 開元通寶; pinyin: kāiyuán tōng bǎo) have the character Min (Chinese: 閩; pinyin: mǐn) on the reverse. They are from the Fujian region and made of lead. Kai Yuan tong bao (Chinese: 開元通寶; pinyin: kāiyuán tōng bǎo) have the character Fu (Chinese: 福; pinyin: fú) on the reverse in reference to Fuzhou. They are made of lead. In 916, Wang Shenzhi, King of Min, minted a small lead Kai Yuan coin in Ninghua County of Dingzhou Prefecture in Fujian Province, where deposits of lead had been discovered. The lead coins circulated together with copper coins. Yong Long tong bao (Chinese: 永隆通寶; pinyin: yǒnglóng tōng bǎo) have the character Min (Chinese: 閩; pinyin: mǐn) on the reverse and comes from the Fujian region. There is a crescent below. It is made of iron and dates from 942. One of these large Yong Long coins was worth 10 small coins and 100 lead coins. A string of 500 of these poorly made Min iron coins were popularly called a kao (literally: "a manacle"). Tian Ce Fu Bao (Chinese: 天策府寶; pinyin: tiān cè fǔ bǎo) are made of iron. Ma Yin, originally a carpenter, was given the rank of Supreme Commander of Tiance, Hunan, by Emperor Zhu Wen of the Later Liang, and minted this coin in 911 to commemorate the event. Ma Yin later became King Wumu of Chu. Qian Feng Quan Bao (Chinese: 乾封泉寶; pinyin: qiān fēng quán bǎo) are made of iron. According to the histories, because there was much lead and iron in Hunan, Ma Yin took the advice of his minister Gao Yu to cast lead and iron coins at Changsha in 925. One of these was worth ten copper cash, and their circulation was confined to Changsha. Merchants traded in these coins, to the benefit of the State. In 2000, a hoard of over 3,000 of these coins was found near Changsha. Extremely rare bronze specimens are also known. Da Shu tong bao (Great Shu currency) (Chinese: 大蜀通寶; pinyin: dà shǔ tōng bǎo) are attributed to Meng Zhixiang when he became Emperor Gao Zu of Shu in Chengdu in 934. He died three months later. Despite its rarity, some say this coin continued to be cast by his son, Meng Chang, until 937. Bao Da yuan bao (Chinese: 保大元寶; pinyin: bǎo dà yuán bǎo) has on the reverse the character tian above. They are made of iron and date between 943-57. There is also an extremely rare bronze example of this coin. Yong Tong Quan Huo (Chinese: 永通泉貨; pinyin: yǒng tōng quán huò) were produced after 959. Li Jing was short of funds for his army at that time. His minister Zhong Mo obtained permission to cast large coins, one equal to ten, with this inscription. In 964, the coin was withdrawn when Zhong Mo incurred the displeasure of the Emperor. Tang Guo tong bao (Chinese: 唐國通寶; pinyin: tang guó tōng bǎo) are written in seal, li, and regular script. They date from 959. Da Tang tong bao (Chinese: 大唐通寶; pinyin: dà táng tōng bǎo) are written in li script and date from 959. Kai Yuan tong bao (Chinese: 開元通寶; pinyin: kāiyuán tōng bǎo) are written in li script and date from 961. Distinguished from Tang period Kai Yuan by the broader rims, and the characters being in less deep relief. In the second year of Qiande (961), Li Yu ascended the throne, and the resources of the country being exhausted, his minister Han Xizai obtained permission to cast coins. These were on the Kai Yuan model, but in seal writing devised by the scholar Xu Xuan. This coin was slightly larger than the old Kai Yuans, and had broader rims, and was found convenient by both the government and the people. Kai Ping yuan bao (Chinese: 開平元寶; pinyin: kāipíng yuánbǎo) were made from lead. Attributed to Liu Yin, the founder of the Southern Han Kingdom, who apparently cast it to commemorate this Liang dynasty period title (907–10). Excavated in Guangdong. Qian Heng zhong bao (Chinese: 乾亨重寶; pinyin: gān hēng zhòng bǎo) were made from bronze and lead. Kai Yuan tong bao (Chinese: 開元通寶; pinyin: kāiyuán tōng bǎo) are based on Tang Dynasty coins. They have a local style with numerous reverse inscriptions – apparently series numbers. There is a very great variety of such coins; some have crescents on the reverse. The Kai character sometimes looks like yong (Chinese: 永; pinyin: yǒng). Characters and legends often reversed because the incompetent workmen had not mastered the art of engraving in negative to make the moulds. Some specimens have meaningless characters. Wu Wu, Wu Wu Wu, Wu Wu Wu Wu, Wu Zhu, and Kai Yuan Wu Wu coins are typical of the hybrid inscriptions formed by combinations of inappropriate characters. They also have series numbers on the reverse. In 924, it was reported: In the shops and the markets, control of silk and money has resulted in the circulation of small lead coins which we readily find in great quantities; they all come from south of the [Yangtze] river whence the merchants transport them here surreptitiously. In 929, the Chu authorities fixed the value of a lead coin as 1/100 of a bronze coin. In 962, it was decreed that the lead coins should circulate in towns, and copper coins outside of them. Those contravening this risked the death penalty. Nearly all the coin hoards of this period are of lead coins found in towns, e.g. the Guangfu Road, Guangzhou hoard of 2,000 coins. It is clear that most of these coins were made unofficially by the merchants or the people. From 822, the You Zhou (within modern Hebei) area enjoyed virtual independence from the rest of the empire. At the end of the ninth century the Regional Commandant of You Zhou was Liu Rengong, succeeded by his son Liu Shouguang from 911. The histories say that Liu Rengong minted iron coins. He is also said to have ordered his subordinates to collect up all [old?] bronze coins and bring them to Da An mountain where he buried them in a cave. When they had all been hidden away, he killed the workmen and covered over the entrance. The coins below have been found together in the north of China. Opinion on their attribution is divided. Although Yong An was a Xia dynasty period title, these coins appear to be the result of unregulated minting, which seems appropriate for the regime of the Liu family. The above are found in bronze and iron. Wu Zhu (Chinese: 五銖; pinyin: wǔ zhū) are made from iron. Huo Bu (Chinese: 貨布; pinyin: huò bù) with the reverse: San Bai (Chinese: 三百; pinyin: sānbǎi; literally: "Three hundred"). Shun Tian yuan bao. (Chinese: 順天元寶; pinyin: shùn tiān yuánbǎo) are made from iron. Obverse and reverse of a Tian Xi Tong Bao coin. In 960, General Zhao Kuangyin had the throne thrust upon him by mutinous officers. He allowed the Later Zhou family to retire peacefully and established the Song Dynasty. Coins were the main basis of the Song monetary system. Cloth had reverted to the status of a commodity. Aided by the exploitation of new copper mines, cash were produced on a large scale. By the Yuanfeng period (1078–85), casting from 17 different mints produced over five million strings a year of bronze coins. Most mints produced 200,000 strings a year; the largest was named Shao Zhou and located in Guangdong, where there was a large copper mine. It produced 800,000 strings a year. 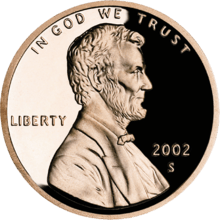 In 1019, the coinage alloy was set at copper 64%, lead 27%, tin 9%. This shows a reduction of nearly 20% in copper content compared with the Tang dynasty Kai Yuan coin. With so much official coinage available, private coining was generally not a serious problem. Song coins were used over much of Asia, especially in Korea, Japan, Annam, and Indonesia. Hoards of Song coins are often found in these countries. A wide variety of ordinary cash coin types was produced. The inscription was nearly always changed when the period title was changed. Seal, li, regular, running, and "grass" styles of writing were all used at various times. Many inscriptions were written by the ruling Emperor, which has resulted in some of the most admired and analysed calligraphy to be found on cash coins. In addition, inscriptions could use yuan bao (Chinese: 元寶; pinyin: yuánbǎo) or tong bao (Chinese: 通寶; pinyin: tōng bǎo), increasing the number of variations possible. Large coins which used zhong bao (Chinese: 重寶; pinyin: zhòng bǎo) were also issued in a variety of sizes and nominal denominations, usually devalued soon after issue. A feature of Northern Song coinage is the sets of dui qian (Chinese: 對錢; pinyin: duì qián; literally: "Matched Coins"). This means the simultaneous use of two or three different calligraphic styles on coins of the same period title which are otherwise identical in size of hole, width of rim, thickness, size and position of the characters and alloy. One can assume that these congruences arose from the workmanship of the different mints, but no attributions have yet been proposed. From the beginning of the dynasty, iron coins were extensively used in present-day Sichuan and Shaanxi where copper was not readily available. Between 976 and 984, a total of 100,000 strings of iron coins was produced in Fujian as well. In 993, for paying the land tax one iron coin was equal to one bronze, for the salary of clerks and soldiers one bronze equalled five iron coins, but in trade ten iron coins were needed for one bronze coin. In 1005, four mints in Sichuan produced over 500,000 strings of iron coins a year. This declined to 210,000 strings by the beginning of the Qingli period (1041). At this time, the mints were ordered to cast 3 million strings of iron cash to meet military expenses in Shaanxi. However, by 1056, casting was down to 100,000 strings a year, and in 1059 minting was halted for 10 years in Jiazhou and Qiongzhou, leaving only Xingzhou producing 30,000 strings a year. Tai Ping tong bao (Chinese: 太平通寶; pinyin: tài píng tōng bǎo) (976–989). Written in li script. Various dots and crescents are found on the reverse. There are also iron coins. The small iron coins come from Sichuan and 10 were equivalent to one bronze coin. The large iron coin have a large dot above on the reverse. This coin was cast at Jianzhou, Fujian in 983, and was intended to be equivalent to 3 bronze coins. No coins were issued with the Yong Xi and Duan Gong period titles (984–89). Chun Hua yuan bao (Chinese: 淳化元寶; pinyin: chún huà yuánbǎo) (990–94). Written in regular, running, and grass script. There are also small and large iron coins. They have a nominal value of 10. In 991, 20,000 iron coins were needed in the market for one roll of silk. Permission was requested to alter the casting to Value Ten coins in the Imperial Script pattern. In one year only 3,000 strings were cast. They were not considered convenient, so casting was stopped. Xian Ping yuan bao (Chinese: 咸平元寶; pinyin: xián píng yuánbǎo) (998–1003). Written in regular script. They are found in both bronze and iron. Jing De yuan bao (Chinese: 景德元寶; pinyin: jǐng dé yuánbǎo) (1004–07). Written in regular script. They are made of bronze; Iron with Value Two; or Iron with Value Ten. The large iron coins were minted at Jiazhou and Qiongzhou in Sichuan in 1005. They weighed 4 qian each. Xiang Fu yuan bao (Chinese: 祥符元寶; pinyin: xiáng fú yuánbǎo) (1008–16). Written in regular script. They are made of bronze or iron. They come in medium size and large sizes. The large iron coins were cast from 1014 to 1016 in Yizhou, Sichuan. Their nominal value was 10 cash and weight 3.2 qian. Xiang Fu tong bao (Chinese: 祥符通寶; pinyin: xiáng fú tōng bǎo) (1008–16). Written in regular script. Tian Xi tong bao (Chinese: 天禧通寶; pinyin: tiān xǐ tōng bǎo) (1017–22). Written in regular script. They are made of bronze or iron. At this time, there were copper coin mints at Yongping in Jiangxi, Yongfeng in Anhui, Kuangning in Fujian, Fengguo in Shanxi, and in the capital. There were also three iron coin mints in Sichuan. Tian Sheng yuan bao (Chinese: 天聖元寶; pinyin: tiān shèng yuánbǎo) (1023–31). Written in seal, regular and li script. Ming Dao yuan bao (Chinese: 明道元寶; pinyin: míngdào yuánbǎo) (1032–33). Written in seal and regular script. There are iron coins with this inscription. Jing You yuan bao (Chinese: 景祐元寶; pinyin: jǐng yòu yuánbǎo) (1034–38). Written in seal and regular script. There are both small and large iron coins. Huang Song tong bao (Chinese: 皇宋通寶; pinyin: huáng sòng tōng bǎo) (1039–54) use seal and regular script, and have many variations. They are made of iron and have two forms with either small or large characters. The small character iron coins are associated with casting in Shaanxi and Shanxi in the Qing Li period (from 1044). The large character iron coins are associated with Sichuan mints. The histories say that the Huang Song coin was cast in Baoyuan 2 – 1039. As it is rather common, and there are no bronze small cash from the next three periods, it appears to have been issued for longer than one year. Kang Ding yuan bao (Chinese: 康定元寶; pinyin: kāngdìng yuánbǎo) (1040). Written in li script. They are made of iron and come in both small and medium sizes. Qing Li zhong bao (Chinese: 慶歷重寶; pinyin: qìnglì zhòng bǎo) (1041–48). Written in regular script. There are two forms: large bronze coins and large iron coins. The Qing Li large bronze coins, intended to be worth 10 cash, were cast in Jiangnan to fund the war with the Western Xia. Iron coins were cast in Shanxi and other prefectures. The large coins caused prices to leap up and both public and private interests suffered. In 1048, the large iron coins were devalued to 3 iron cash. Zhi He yuan bao (Chinese: 至和元寶; pinyin: zhì hé yuánbǎo) (1054–55). Written in seal, regular, and li script. Zhi He tong bao (Chinese: 至和通寶; pinyin: zhì hé tōng bǎo) (1054–55). Written in seal, regular, and li script. 1 2 3 4 5 6 7 8 9 10 11 12 13 14 15 16 17 18 19 20 21 22 23 24 25 26 27 28 29 30 31 32 33 34 35 36 37 38 39 40 41 42 43 44 45 46 47 48 49 50 David, Hartill (September 22, 2005). Cast Chinese Coins. Trafford Publishing. ISBN 978-1412054669. ↑ "中國最早金屬鑄幣 商代晚期鑄造銅貝" [China's first metal coins: copper casting in the late Shang Dynasty]. henan.gov.cn (in Chinese). ↑ Giedroyc, Richard (2006). The Everything Coin Collecting Book: All You Need to Start Your Collection And Trade for Profit. Everything Books. ISBN 9781593375683. ↑ “临安府行用”钱牌 Archived June 19, 2010, at the Wayback Machine. David Hartill. CAST CHINESE COINS. Trafford Publishing 2005. The Daniel K.E. Ching Sale. June 2, 1991. Scott Semans, Seattle. Fisher's Ding. An annotated version of the Ding Fubao catalogue prepared by George A. Fisher, Jr. Colorado, 1990. Richard Von Glahn. Fountain of Fortune (Money and Monetary Policy in China 1000-1700).California, 1996. Norman F. Gorny. Northern Song Dynasty Cash Variety Guide. Volume 1 Fugo Senshu. USA, 2001. David Hartill. Qing Cash (Royal Numismatic Society Special Publication 37). London, 2003. Charles O. Hucker. A Dictionary of Official Titles in Imperial China. California, 1985. Peng Xinwei. A Monetary History of China (Zhongguo Huobi Shi). Trans. Edward H. Kaplan. Western Washington University, 1994. F. Schjoth. Chinese Currency. London, 1929. François Thierry. Monnaies chinoises: I L'Antiquite preimperiale. Paris, 1997. II Des Qin aux Cinq Dynasties. Paris, 2003. Tung Tso Pin. Chronological Tables of Chinese History. Hong Kong, 1960. D.C. Twitchett. Financial Administration under the T'ang Dynasty. Cambridge, 1970. Wang Yu-Chuan. Early Chinese Coinage. New York, 1980. Xinjiang Numismatics. Ed. Zhu Yuanjie et al. Hong Kong, 1991. 《大泉圖錄》 Da Quan Tulu (Register of Large Cash). 鮑康 Bao Kang. Peking, 1876. 《古钱大辞典》 Gu Qian Da Cidian (Encyclopaedia of Old Coins). 丁福保 Ding Fubao. Shanghai, 1936. 《開元通寶系年考》 Kai Yuan Tong Bao Xi Nian Hui Kao (Kai Yuan Tong Bao. A Chronological Classification). 杜维善 顾小坤 Dun Weishan & Gu Xiaokun. Shanghai, 1996. 《兩宋鐵錢》 Liang Song Tie Qian (Iron Coins of the Two Song Dynasties). 閻福善 Yan Fushan (et al. eds). Peking, 2000. 《清朝錢譜》 Shincho Senpu. (Qing Dynasty Cash Register). Hanawa Shiro. Tokyo, 1968. 《太平天國錢幣》 Taiping Tianguo Qianbi (Coins of the Taiping Heavenly Kingdom). 馬定祥 馬傅德 Ma Dingxiang & Ma Fude. Shanghai, 1983. 《咸豐泉匯》 Xianfeng Quan Hui (A Collection of Xianfeng Coins). 馬定祥 Ma Dingxiang. Shanghai, 1994. 《中國古錢目錄》 Zhongguo Gu Qian Mulu (Catalogue of Old Chinese Coins). 華光普 Hua Guangpu. Hunan, 1998. 《中國錢幣大辭典 － 先秦編》 Zhongguo Qianbi Da Cidian – Xian Qin Bian (Chinese Coin Encyclopaedia – Early Times to Qin). 李葆華 Li Paohua (ed.). Peking, 1995. Wikimedia Commons has media related to Coins of China.